Yesterday we finally received our refund from Time Warner, so our all expenses have been settled from our move in mid-September! (6-8 weeks to issue the refund and 3 weeks to have it mailed. Seriously??) I can finally report what our in-town move cost and compare it to what we spent last year. 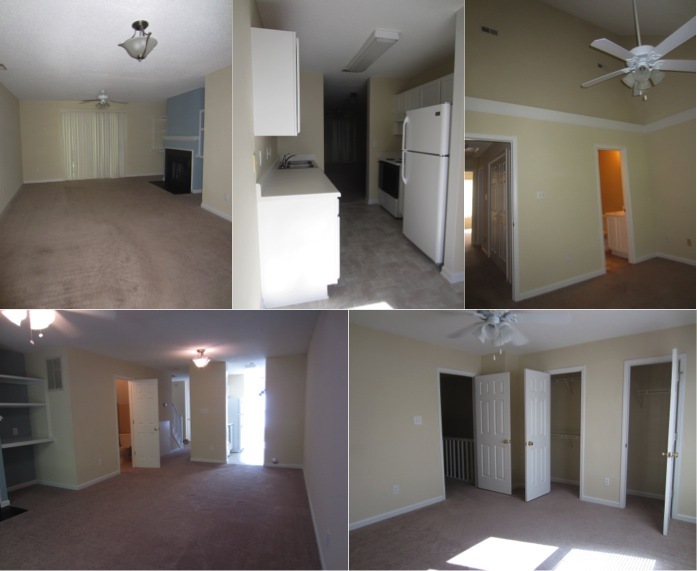 The two townhouse rentals are very similar – both about 1200 square feet, both 2 bedroom/2 bath, and about a mile apart off the same main road. We had six days of overlap between the two residences. Since we went through basically the same process as last year, many of our expenses are the same or similar – the cost of the moving process itself and most of the fees. The total net cost of last year’s move was $287.27 and the total cost of this year’s move was $566.58. The big differences were that last time we sold our washer and dryer and this time we were hit with two large unexpected expenses – the water initiation fee and the professional rug cleaning. The one break we caught this time around was that we negotiated $100 off the first month’s rent at our new place. I also decided this time to not calculate the overlap in utilities since we stayed under budget in all the categories in September. Excluding the expenses we covered out of checking at the time (under “things purchased”), we need to repay ourselves $444.29 for this move. As I anticipated, we won’t be doing this out of rent savings, as our rent is only $25 less per month than it was at our last residence. We’re only going to be here for around a year (give or take) and the breakeven time is 1.5 years. But until the moving expenses are repaid, all our budget leftovers will go to our nest egg. Thankfully, we are happy with the new place, though it is a different layout from the last one. The last townhouse had an enormous master bath and walk-in closet, so giving that up is a little hard – it’s not as easy to brush our teeth at the same time! But generally I like that we have two similarly-sized bedrooms upstairs instead of the one-up one-down asymmetric model at the last place. And now when Kyle stays up late to work in his home office we’re still on the same floor! Both townhouses have galley kitchens, although the new one is slightly smaller. We bought a tall rack for the kitchen to put appliances on, so that has made things a lot more functional. I’m definitely looking forward to having a sprawling kitchen again like we did with our apartment. This townhouse is so much better for roommates so if Kyle ever moves out I’ll have an easier time pricing the room (half, exactly). 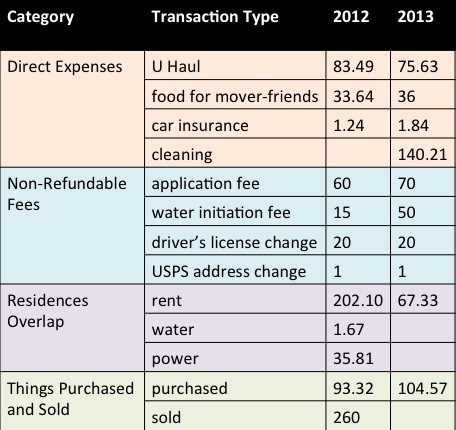 What ditto expenses did you notice the last time you moved, and which surprised you? Do you save up in advance for moving expenses or do you pay yourself back after it’s done? What do you like and dislike about your current home? 17 Responses to "The Cost of an In-Town Move Part 2"
Sorry to be random – but is that carpeting in the kitchen!?! Your high ceilings look awesome. I wonder if you’ll see any increases in your electric/heating bills because of them (we did when we moved to a place with high ceilings) – or if it’ll just be similar to the two-story design you had before. Nope, though the color does look similar in the pics – there’s linoleum in the kitchen, breakfast nook, and bathrooms, and carpet everywhere else. Probably it will be similar to the last place because of the vaulted ceilings there, too, but we’ll see! We only have 1 year of data there and 1 here so it’s hard even to draw a comparison. I think the kitchen flooring is light-colored tile, right? Carpeting in the kitchen would be strange. Good luck with settling in and happy Thanksgiving!! Well Heeled Blog recently posted..Thanksgiving in Washington, D.C.
Yeah, carpet in the kitchen would be difficult – I spill a lot! Happy Thanksgiving! We’ll be in the DC area as well. My parents had carpet in their kitchen back in the 80’s… little did they know there was lino underneath it, so they could have easily pulled it up. They just didn’t have the money to re-do it at that point, being young parents of two children and just buying their first home. My last move wasn’t in city and cost a pretty penny – it was in-province but it was about as far away as you could get. Thankfully my new company reimbursed me for the vast majority of it (90% roughly). That is a pretty good reimbursement rate. Did you use professional movers and would you have if you weren’t being reimbursed? We did use professional movers – they even packed for us – for two main reasons. I had moved to my new city very quickly (start date was ASAP), and it would have been nearly impossible to coordinate everything. Also, I was being reimbursed a flat rate, assuming I spent it. Essentially they would pay $X, but if I was under that, I wouldn’t have kept it. So to remove the hassle, and because it was reimbursed, I went ahead with pro movers. Great experience… but none of our lamps worked after the move. I am sure it is not so much the conspiracy I stated it as, but three table lamps were either busted, or no longer work when plugged in. I like the vaulted ceilings, it looks really nice! I’m currently saving for our next move. More than likely my boyfriend will be reimbursed by his company as he will be transferring, but who knows how long that might take. I spent around $80 for the u-haul rental when we moved here, and we packed everything ourselves. We’re currently in a basement apartment, so I just wish we had access to more sunlight. That’s great that you’re saving for your move already. How much are you budgeting and when are you planning to move? You know, even though we have an above-ground dwelling, we always keep our shades drawn. I guess it’s for privacy and we’re too lazy to open and shut them. Yikes.